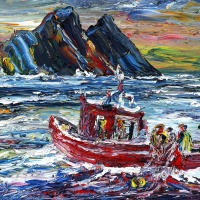 Liam O’Neill was born in Corcha Dhuibhne, West Kerry, Ireland, in 1954 and is among Ireland`s most talented contemporary artists. He is a self taught painter who over the last twenty years has shown work at the Royal Hibernian Academy, Oireachtas, National Portrait Exhibition and Claremorris Open. 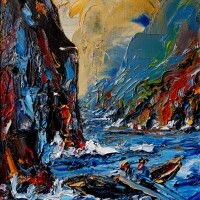 His paintings are collected nationally and internationally. His obsession with the west coast has been his main source of motivation and inspiration over the years. 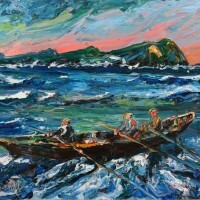 His paintings recapture images of harbours, horse fairs, landscapes, fishermen, bog and meadow scenes. 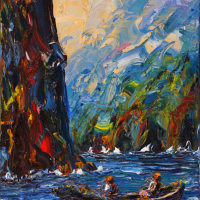 The animated strokes of bright colour, which are spontaneously applied in a loose expressionistic manner using a palette knife, emphasise the passionate freedom of the artist’s style. Liam’s inspiration also comes from the colour and spectacle of race meetings, The Curragh, Cheltenham, Aintree, and local Flapper Races such as Dingle and Béal Bán Beach. Further inspiration comes from life in the Arts and Public Life, with portraits of John Wayne,Richard Harris, former Taoiseach Charles J. Haughey and the great Irish writers such as Samuel Beckett.